Article written by Activity Alliance. 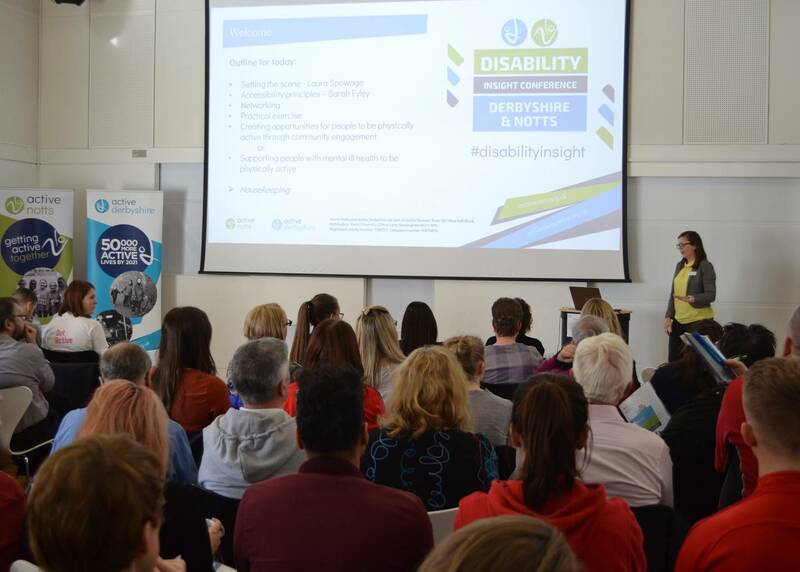 On Wednesday 20 March, Active Derbyshire and Active Notts joined forces to host a Disability Insight Conference at New Art Exchange in Nottingham, with support from Activity Alliance. The event brought together organisations from across the region to better understand the factors that influence disabled people’s participation in sport and physical activity. The conference was a blend of engaging presentations, workshops and networking. Delegates enjoyed opportunities to share their experiences of working with disabled people and discuss the barriers that can prevent individuals being active. Key topics included accessible facilities, delivering inclusive community projects and supporting people with mental health problems to be more active. Key speeches in the morning came from Laura Spowage, Health and Wellbeing Programme Manager at Public Health England, East Midlands, and Sarah Eyley, an Accessible Facilities Advisor on behalf of Activity Alliance. In the afternoon, delegates attended workshops delivered by Nottinghamshire’s local MIND and the Get Out Get Active project in Nottingham. The event concluded with a funding clinic delivered by Active Derbyshire and Active Nottinghamshire, for organisations wanting to find out about potential funding and grant opportunities to support and develop their work with disabled people. "Overall the event was successful in creating conversation and facilitating various discussions. Going forward we will be exploring doing similar events to continue to raise awareness and provide organisations with the insights they need to champion disability inclusion. We'd also like to thank all of those involved for contributing their time and experiences." Activity Alliance Engagement Advisors work across England to enable more organisations to effectively engage disabled people. Our East Midlands Advisor, Catherine Slater, worked with both organisations to set up this important event. Activity Alliance funding enabled organisers to deliver the event in a way that met the needs local partners and encourage better engagement. "Active Derbyshire and Active Notts delivered an insightful and informative event to engage many partners across Nottinghamshire and Derbyshire. I hope attendees gained further insight on how they can improve their working practices to be more inclusive and place disabled people at the heart of existing and new activity programmes. "The conference was key for partners across the region to look at how they can work collaboratively to tackle the barriers to physical activity, so disabled people and people with long term health conditions can be as active as they want to be." Active Derbyshire and Active Notts’ key aims are to reduce levels of inactivity by making physical activity and sport the norm for people who live, study and work in Derbyshire and Nottinghamshire. They provide the strategic lead on sport and recreation across the counties and are committed to working with partners to increase the number of people taking part in sport and physical activity. For more information please visit Active Derbyshire and Active Notts website. If you are looking for guidance or more information on engaging more disabled people to be active in sport and physical activity across the East Midlands, please email Activity Alliance Engagement Advisor Catherine or call 01509 227750. Find out more about Activity Alliance Engagement and Partnerships team and their work. Kent Sport's new initiative the The KUDOS Award recently choose its first winner.